Apply on this page for membership to Leaders Excellence, an exclusive members’ club at Harvard Square for online leadership networking and lifelong learning available for leaders globally. The biannual membership fee of $99 entitles you to an array of powerful benefits that can help you build your professional network, discover new opportunities, and advance your leadership. As our events and resources are online, it doesn’t matter where you’re located. Upon acceptance and receipt of payment, you will receive an official uniquely numbered certificate of membership and a digital membership seal to your LinkedIn profile. 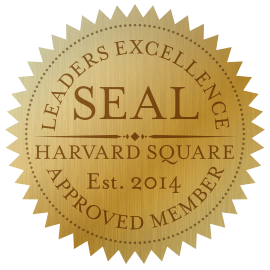 With a Leaders Excellence membership certification in Harvard Square, you gain the right to use the esteemed membership title: MLE℠ (Member of Leaders Excellence), an approved and registered service mark by the Commonwealth of Massachusetts. Additionally, you will get access to our networking and learning platform which includes a wealth of resources and online podcast lectures on key topics that drive organ­i­za­tional and personal growth. In order for you to become a member, you must currently hold a position in mid- to senior level management. Membership is offered on a qualification- or invitation-only basis to preserve the integrity and exclusivity of our network. If your background is comparable to our members’ profiles, you are a good candidate for membership to Leaders Excellence. We require our applicants to pay the membership fee of $99 in advance so that we can validate the commitment and authenticity of the application. After submitting your application below, you will be forwarded to our payment page. Upon receipt of your payment, we will review your application and respond within 48 hours. Should your application not be approved, we will issue an instant refund.